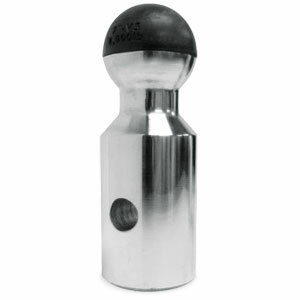 The Rapid Hitch "Alumiball" Greaseless Single Towing Ball features a nylon composite cap that eliminates the need for lubrication of any kind - truly greaseless. No more grease or rust on your hands and clothes. Just hook up your trailer and go! Lifetime replacment warrenty on nylon cap! And saving the best for last, the polished aluminum Rapid Hitch is competitively priced with the old-technology steel-shank units.